Folic Acid is the ornamental term given to a type of B vitamin that is necessary for vital functions within the human body. It is a synthetic form of folate that can be found in supplements and added to fortified foods. Folic Acid is the ornamental term given to a type of B vitamin that is necessary for vital functions within the human body. It is a synthetic form of folate that can be found in supplements and added to fortified foods. Folate is the general term for both folic acid and folate found naturally in foods. Leftover amounts of folic acid in the body are excreted through the urine. Since the body is unable to store folic acid, a continuous supply from food or supplementation is necessary. Natural sources of folate include the following? Folate is responsible for facilitating tissue growth and helping cells to perform their functions properly. During and after pregnancy, adequate folic acid intake is essential for preventing certain birth defects such as spina bifida. Folate has also been found to prevent anemia. A study in 2013 at Emory University in Georgia analyzed the effect of the mandatory folic acid fortification of cereal grains that the United States implemented in 1998. The data suggested that after this fortification, the prevalence of anemia due to folate deficiency was nearly nonexistent in a United States population. This data demonstrates that with regular cereal intake containing folic acid, folic acid deficiency can be avoided. In conjunction with vitamin B12 and vitamin C, folate helps to break down, utilize, and produce new proteins. It is involved in the formation of new red blood cells and DNA, which carries genetic information. It is important to check the labels on these products to ensure that they are folate rich foods, especially for pregnant women. The 1998 mandatory program to add folic acid to enriched bread flours, pasta, cornmeal, rice, and other grains was done to aid in the prevention of spina bifida and anencephaly. These are birth defects caused by folate deficiency in a woman’s body around the time her baby is conceived. In 2004, the Eunice Kennedy Shriver National Institute of Child Health and Human Development in Maryland studied the prevalence of neural tube defects before and after food fortification with folic acid. It was discovered that the number of children born with neural tube defects decreased by 25-50%. 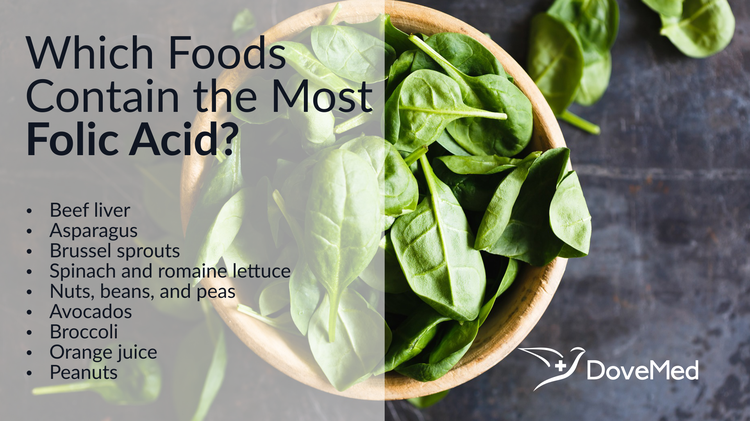 From the list of foods provided above, it is apparent that folic acid is simple to obtain from either natural, fortified, or supplement sources. Talk to an expert about your current folic acid intake, as they can help you to decide if you are getting adequate amounts of the mineral in your diet or if you need to incorporate more foods rich in folic acid. Making foods high in folate a fundamental component of your daily nutrient intake will not only benefit your health, but as a woman, it will most definitely influence your child’s health as well. Mills JL, Signore C. Neural tube defect rates before and after food fortification with folic acid. Birth Defects Res A Clin Mol Teratol. 2004;70(11):844-5. Odewole OA, Williamson RS, Zakai NA, Berry RJ, Judd SE, Qi YP, Adedinsewo DA, Oakley Jr GP. Near-elimination of folate-deficiency anemia by mandatory folic acid fortification in older US adults: Reasons for Geographic and Racial Differences in Stroke study 2003-2007. The American Journal of Clinical Nutrition. 2013;98(4):1042-1047. Quinlivan, E. P., & Gregory, J. F. (2003). Effect of food fortification on folic acid intake in the United States. The American journal of clinical nutrition, 77(1), 221-225. Crider, K. S., Bailey, L. B., & Berry, R. J. (2011). Folic acid food fortification—its history, effect, concerns, and future directions. Nutrients, 3(3), 370-384. Ray, J. G. (2004). Folic acid food fortification in Canada. Nutrition reviews, 62(suppl 1), S35-S39. Scott, J., Rébeillé, F., & Fletcher, J. (2000). Folic acid and folates: the feasibility for nutritional enhancement in plant foods. Journal of the Science of Food and Agriculture, 80(7), 795-824. Berry, R. J., Bailey, L., Mulinare, J., Bower, C., & Dary, O. (2010). Fortification of flour with folic acid. Food and Nutrition Bulletin, 31(1 suppl1), S22-S35. Rader, J. I., Weaver, C. M., & Angyal, G. (2000). Total folate in enriched cereal-grain products in the United States following fortification. Food Chemistry, 70(3), 275-289.